One of the most important skills for a pastry cook to develop when advancing is how to temper chocolate. When melted, the cocoa butter in chocolate doesn’t naturally resolidify into the proper crystallization structure. 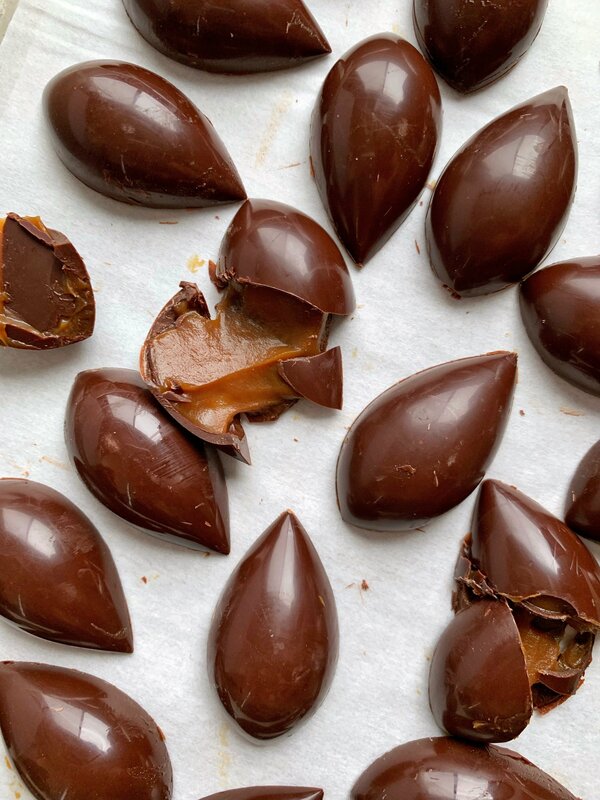 The goal of tempering is simple: to form the right types of crystallization in the cocoa butter so that you get chocolate that has a shiny surface and snaps cleanly when broken. Untempered chocolate sets matte, often with white streaks of cocoa butter on the surface (this is called “bloom”) and crumbles rather than breaks evenly. *TIP: Make sure you are using a premium-grade chocolate. You cannot use chocolate chips, as they contain stabilizers and are not able to be tempered. Start with a marble or granite surface, which is clean and dry and doesn’t absorb heat. Make sure the surface is cool (if not, or if the room is very warm, lay a rimmed sheet pan on the marble then fill it with ice. Let the chilled sheet pan rest on the marble for a few minutes to cool it down). 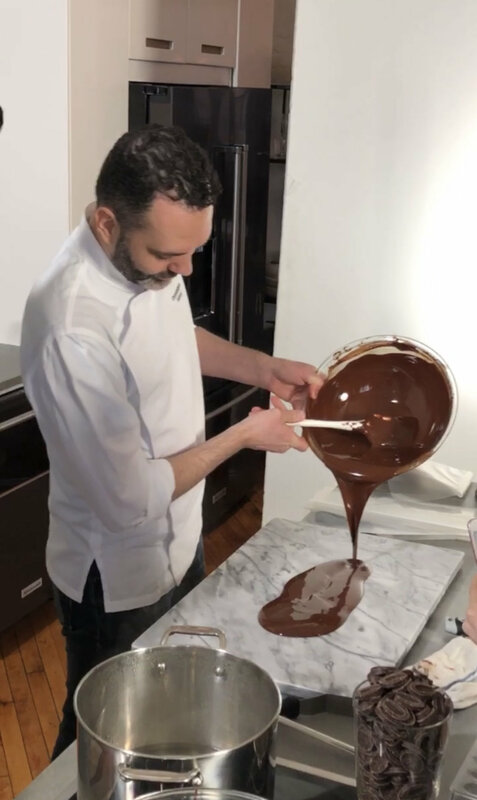 When the chocolate is ready, remove the bowl from the saucepan, making sure to wipe the bottom dry so condensation doesn’t drip onto the marble surface. (If you used the sheet pan with ice to cool down your surface, remove at the this time and wipe the marble until it’s completely dry. You do not want any water coming in contact with the chocolate.) Pour 80 percent of the melted chocolate onto the work space. Using two palette knives, slowly move the chocolate around to agitate it. Scrape the knives against each other to clean them as you work. Watch as the chocolate starts to thicken and develop a gleam. The temperature should be about 84°F (29°C), and the chocolate should feel slightly cool to the touch, as it’s just below body temperature. 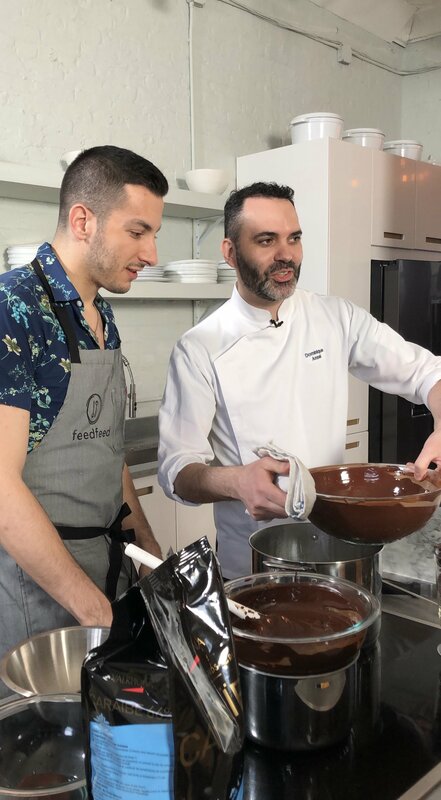 In your first few times tempering, always make sure to test by dipping an offset spatula or piece of parchment paper into the chocolate to see if it sets shiny. If not, try again with the same chocolate. Once tempered, chocolate must be used immediately. If it solidifies, re-temper. This technique may be faster, but it’s less precise. It is a great alternative for smaller kitchens. Melt two-thirds of the chocolate that you want to temper. The chocolate should be tempered to the proper temperature (listed above) when all the chopped chocolate has been incorporated. Two things will ruin chocolate and make it unusable. If you heat chocolate on its own to over 129°F (54°C), you will burn or scorch it. If you wet the chocolate with water or steam while tempering it, the chocolate will seize and turn grainy and pasty. Want to put your tempering to the test - find the recipe for Chef's Chocolate Bonbons HERE!